Robust, 3-piston axial pump with a brass cylinder head and stainless steel valves. Pump is protected by pressure switch, overflow value, and soft damping system. 5 year warranty on pump. 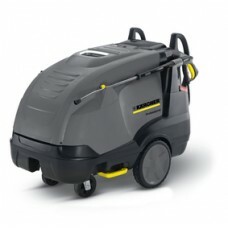 9.5 HP water cooled motor, 230V/ 1ph/ 30 amps motor capable of cold, hot and steam under variable pressure. Kärcher burner operates with 92% burner efficiency providing the most fuel-efficient heating in the industry. Steam capable at the turn of a knob! Pressure washer includes new ECO setting which allows the machine to operate in the most economical temperature range (140° F) saving an additional 20% less fuel than at full-load operation (180° F), by optimizing burning cycles. Standard features also include: Pressure-controlled auto start/stop ensures complete shut-down when trigger gun is released; an anti scale system to prevent build-up of deposits in heater coil, low-fuel and low-water protection to prevent machine from running with low supplies, exhaust temperature sensor system shuts down burner when flue temperature exceeds 572° F, double thermal overload protection against high amps or temperatures, and has variable water pressure, volume, temperature control, and detergent metering. 50' Kärcher high-pressure steam hose rated for 311° F and 5800 PSI with a swivel end and can be hand tightened easily. Easy-Press trigger gun with 41" stainless steel wand with 360° rotation under pressure. Power nozzle delivers 40% more impact than standard nozzles for faster cleaning.